Jean Evansmore left and Mount Hope Mayor Michael Martin cut the ribbon to open the Dubois High School Museum on Saturday on 116 main street, Mount Hope. Welcome to DuBois on Main! They are an educational non-profit located in Mount Hope, WV. They present the history and contributions of DuBois High School (1917-1956) through intergenerational and interracial gatherings, workshops, and exhibits at our museum and community space. MOUNT HOPE — A new museum in Mount Hope is committed to bringing the history of DuBois High School into the public eye and creating a space for the community to gather. 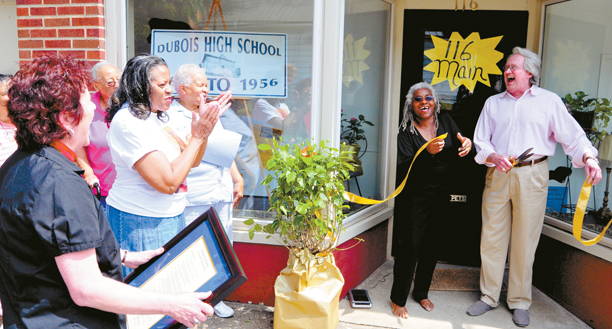 About 25 people attended the recent ribbon-cutting ceremony for 116 Main Street, many proudly connected to DuBois, which taught black youth of the area until integration in 1956. 116 Main St. founder Jean Evansmore says generous neighbors and helpers made the day a success. “People just chipped in and did whatever needed to be done,” she said. Some arrived early to help set up. Another volunteered to stand by the registry. A donation jar yielded the promise of an air conditioner and a flower arrangement. Coffee mugs, too, arrived the next day. To beat the heat inside the un-air conditioned building, the audience fanned themselves with printed paper fans bearing information about 116 Main. Evansmore — a Scarbro native and 1958 DuBois graduate who moved back to Fayette County in May — kicked off the event, while Mount Hope Mayor Michael Martin presided over the ribbon-cutting. The main presentation came from Eunice Fleming of Mount Hope, who Evansmore believes is the only surviving teacher from DuBois High School. Attendees gathered in the building’s community room to hear a presentation about local people from Fleming. Afterward, the group moved back into the museum area to take in a display of DuBois history. In an era of racial segregation, former DuBois students say the school offered a stellar education and knit together the black community of the area after struggles for access to education. “DuBois High School had some of the best-educated teachers around,” says Evansmore. She wants to share that “positive, good history,” especially with the young people in Mount Hope. “I want kids like those walking past here to know about the history of DuBois students because many will find out, oh, that was my uncle or aunt. What does that do to you but make you feel good?” she said. Evansmore is working to get together a schedule for the fall and wants to host at least one event per month. “It won’t always just be talking. I feel like there are so many options,” she said. Those she mentioned include showing films, teaching classes, exercising and hosting ‘Let’s Talk’ sessions to discuss issues of local importance. “I think … getting people together is really the very important part of what’s happening,” she said. She hopes the changing displays will inspire people to dig into their closets for relevant history, pictures and other artifacts that could form the basis of an exhibit. Evansmore said she is looking for display cases, volunteers and input from the community about their ideas for 116 Main Street. “There are so many things that can be done, and I feel excited about it,” she said. For more information, call 304-877-0070 or stop by 116 Main Street, Mount Hope.